When we have company for dinner it is a moveable feast. Appetizers in one place, dinner at another and coffee (after dessert -- and sometimes with liqueurs) in a third. We often have appetizers in the breakfast room -- it's easy to reach the appetizer in the middle of the breakfast room table while we sip our cocktails. I do easy appetizers -- one I make and then either nuts or olives or cheese and crackers. We don't want to spoil anyone's appetite for dinner! Dinner, of course, is in the dining room -- and my favorite number is six -- six makes for easy conversation and dishes don't seem overwhelming when there are only six of everything! And then, often, especially in the winter, we have coffee in the living room in front of the fire and after dessert. A silver tray with the after dinner coffee pot, creamer and sugar, napkins, and wee demitasse spoons and wee demitasse cups -- in blue and white, of course! Served from the coffee table where I pour and Husband Jim serves our guests. We linger over coffee and conversation -- often refilling the pot. Sometimes, the men will take brandy and go to the breakfast room for cigars. 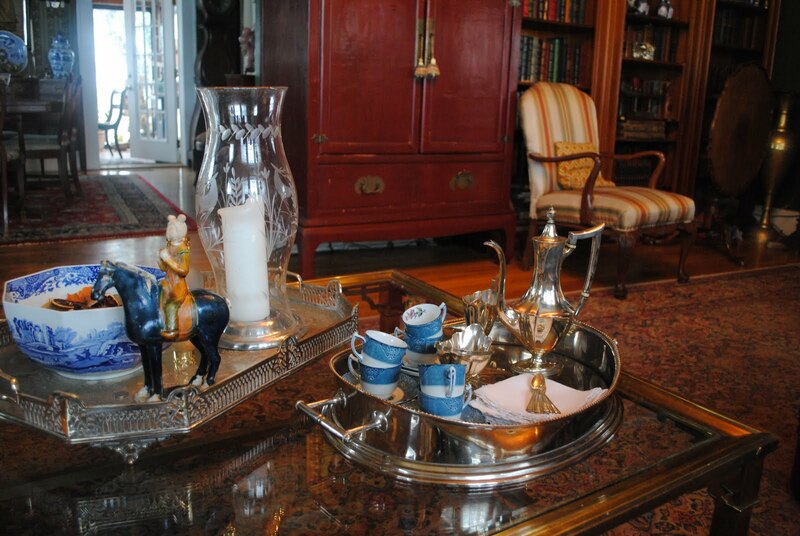 Husband Jim always makes sure that the brandy decanter and snifters are on a table in the breakfast room. The wee cups are English, have a pretty rose in the center of the saucer and a rose inside the cup. I've forgotten the manufacturer and the pattern but they are blue and white and fit in perfectly at Linderhof! It's Thursday and I'm joining Susan at Between Naps on the Porch for Tablescape Thursday and I'm joining Candy at The Little Round Table for The Colour of Love Tablescape -- because love is blue!!!! Looks beautiful Martha and sounds wonderful! What a sweet vignette! I love the little demi cups! Looks so inviting and beautiful! The silver is gorgeous! I love the fact that your Mom and my Grandmother had the same dishes! I love the idea of moving from one room to the other for each part of the dinner. It lets you enjoy your entire entertaining space. Lovely display, everything is especially exquisite with silver. Lovely coffee set for love is blue! 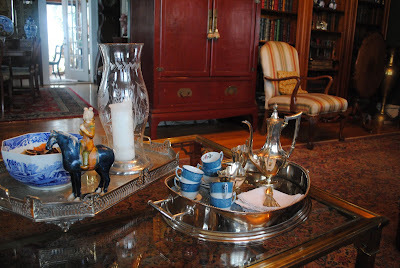 As we prepare for our dinner groups this coming Spring, I mentioned to "Mr. Ed" that I'd like to do dessert on the lower level in front of the fireplace. Thank you for this inspirational post! Beautiful setting Martha, two of my favorites blue and all things silver. Thanks so much for sharing. I like the fact that you serve in different rooms.....that makes for an interesting evening. Your coffee set is so pretty and I love anything BLUE...and if it has a rose, even better! 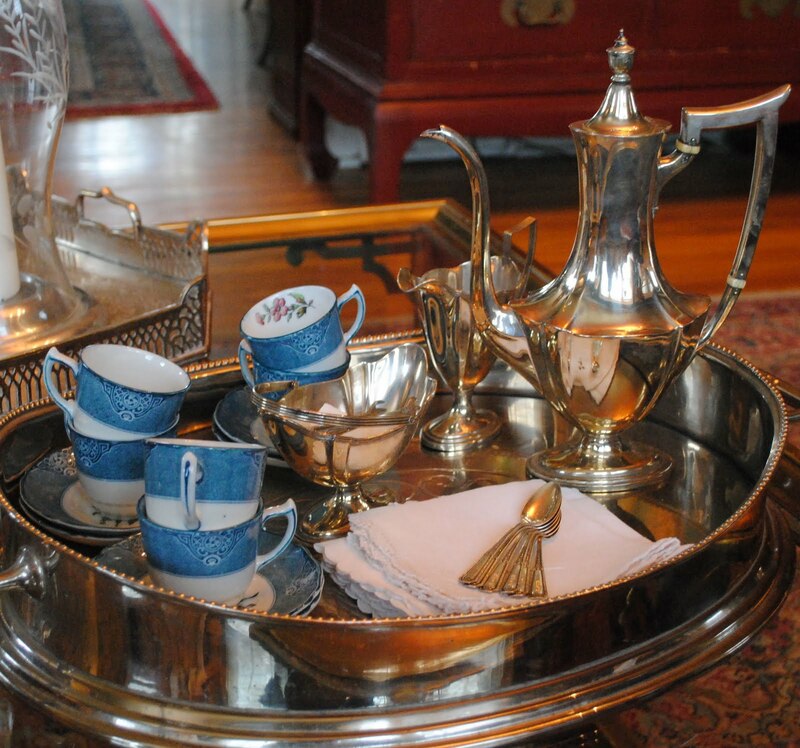 The silver tray is just perfect to use and to showcase your beautiful china. I agree, six makes the perfect dinner party and I too have different courses in different parts of the house. My favorite way of entertaining is when cocktails and apps. can be served on the patio to enjoy the garden. Soon. Your blue cups are lovely. I love the setting in the living room Beautiful. What a lovely way to end a perfect meal. Because we live out in the country, and because our laws have become very strict, it's rare now, that we serve liqueurs - and I miss that. Martha, of course love is blue! I always feel so drawn into your home with your posts. Thank you for welcoming us. And thank you for joining us for our Colours of Love party. Lovely post. I try to move dinner around too. I like to have appetizers on the lanai. With the fountain and the pool, it makes for a nice backdrop. If only it would warm up. I enjoy a meoveable feast myself! Love your sweet blue cups! Lovely setting and so romantic. Your tray is beautiful, I'm so happy to have been able to visit for a bit. Looks like the perfect ending to one of your lovely dinners. Just lovely, Martha. You're kind to share your time-tested common-sense methods for gracious, elegant entertaining. I've already adopted your "one wine glass method" -- makes so much more sense that giving guests before-dinner wine and having a second glass waiting on the dinner table. Often there was a tricky transition to make (plus, as you said, extra glasses to hand wash!). The silver tray, coffee pot, and demitasse cups are all very beautiful! Thanks for sharing your "love is blue" for The Colors of Love. Your service is lovely! Your dinner parties sound so classy. I love the elegance of after dinner coffee with lovely demitasse cups and spoons. I actually find your whole philosophy of entertaining for dinner! Moving from room to room is such a cool idea. Somehow at our house everyone always ends up in the kitchen area even when foodstuffs are in the living room! 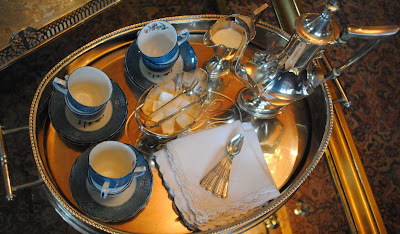 love the little blue cups..
"the men take brandy and go to the breakfast room"... oh, it all sounds so wonderful really....so civilized... I love it.